I can still remember when my kids were babies - it almost seems like a lifetime ago with my son being almost 16, but I do still remember those days well. And in part of those memories I remember being that first time mom worry about what products where safe to use on his delicate skin. So much has changed since then and so many new products are on the market, I can only imagine how moms feel now days. It has to be overwhelming to say the least. Thankfully there are companies out there like bloom BABY that let you know right on the box that they are safe for your precious little ones. bloom BABY wipes are natural right from the start. 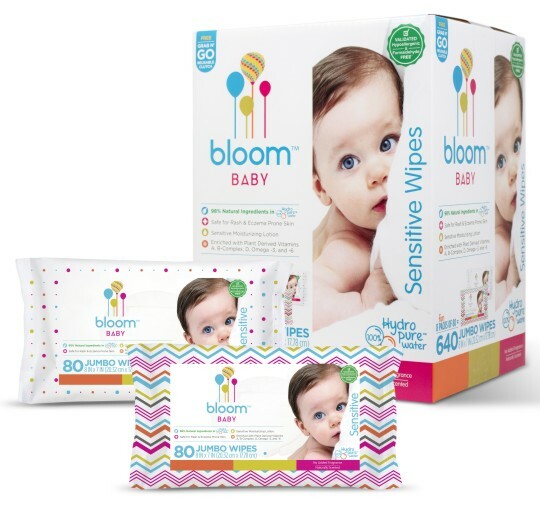 Made from 100% HydroPure water sourced from a 6,000-year-old Canadian glacier, bloom BABY Sensitive Wipes are plant-enriched, biodegradable and non-abrasive toward baby skin. The wipes are gentle and protect skin as they contain 98 percent natural ingredients and are free from harmful ingredients.